Greek Epic/Doom Metal act REFLECTION return after 8 years! Pitch Black Records is thrilled to announce its 50th album release with the signing of legendary Greek Epic/Doom Metal act REFLECTION! Get up to speed on everything you need to know! REFLECTION, the driving force of Hellenic Epic/Doom Metal, will be celebrating their 25th anniversary next year and they are now back, with their fourth album, “Bleed Babylon Bleed”! It’s been eight years since the band’s last offering, making this an eagerly awaited release; and with a new vocalist in their ranks, this becomes an even more anticipated release! As this is quite a special release, label founder, Phivos Papadopoulos, felt the need to briefly comment: “Our 50th release just had to be special. And this is as special as it could get, for a number of reasons! I remember discovering REFLECTION in the early ‘90s and receiving their demo tape after writing to them and how I was blown away by their music. Even more importantly, though, since the day we first made contact, a truly unique bond has been formed between myself and the band’s founder and guitarist, Stathis Pavlantis. With nine track of pure solid epic doom heavy metal, “Bleed Babylon Bleed” has all the elements that have defined REFLECTION’s superb musicianship throughout the years. The band has matured since a long time ago, yet their sound is even more refined now and full-bodied, still incorporating their signature fast to mid and low tempo song ranges. 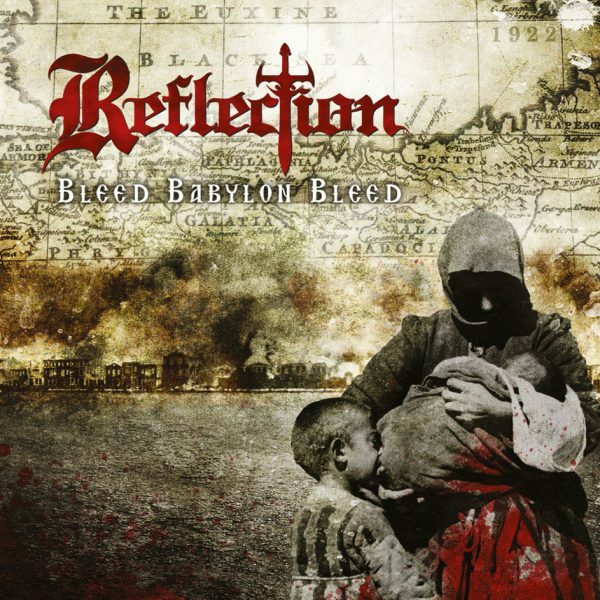 “Bleed Babylon Bleed” is just oozing with atmosphere, epic melodies and powerful emotions as it deals mainly with the Pontic Genocide (as well as genocides in general). The final track marks the album’s culmination as it features a Pontian lyra (masterfully played by Pavlantis) that takes a lead role, beautifully mixed with the rest of the instruments, for an utterly bone-chilling effect. Special mention should be made to the guest appearance of Mats Leven of CANDLEMASS. Besides his majestic input on this album, this is also of particular importance since CANDLEMASS have always been a primary influence for REFLECTION. Other notable guest appearances include Albert Bell (FORSAKEN) and Kostas Tokas (RELOAD). “Bleed Babylon Bleed”, is out on April 7th worldwide on CD and Digital. Pre-orders are up on this link. A track is now available for streaming and free download at www.pitchblackrecords.com.